We may be half way through flu season but we’re just getting warmed up in stew season. You heard me, stew season, and the stew that never fails to comfort and excite me is Korean soon tofu jjigae or sundubu jjigae. This Korean tofu stew is always served in a clay pot because it retains heat like a champ, staying piping hot well into the meal. In fact, the pot is so effective, the stew comes to you still bubbling, and will continue to roil and steam for quite a few minutes, rendering it virtually inedible when it’s first delivered to your table. This is why all those beautiful banchan (Korean side dishes) come along with the main dish; they keep your mouth super happy until that bubbling brew simmers down. Sundubu’s base is commonly the Korean chile paste known as gochujang, but it can also be a rich foundation of anchovies, kelp, beef, seafood, chile pepper, loads of garlic, and many other strong personalities. After the base is established, a delicate silken tofu is introduced to the stew, followed by the meat. My protein of choice is shellfish. Specifically, oyster. I find the deep, briny flavor of oyster stands up well against the pungent, spicy broth that is sundubu jjigae. O. Tofu House in Granada Hills makes a delightful sundubu jjigae, and they’ve opted to strictly use organic tofu in all of their stews. 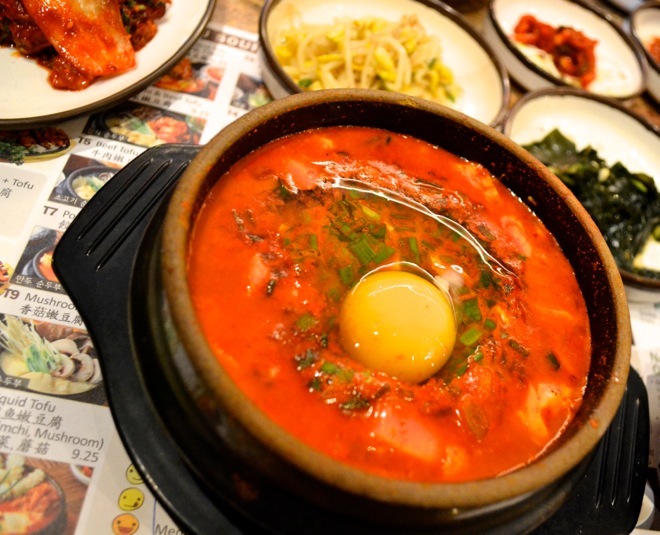 When the jjigae is brought to your table, an egg is cracked into the pot, quickly coagulating from the intense heat. While waiting for it all to cool, I poked around and sampled the banchan. Most of it here is the typical selection—you know… the kimchi, sesame soybeans, seaweed and cucumber salad, nabak kimchi, and the spicy, sticky, sweet squid strips—but I have to say, it was all of above average to excellent in quality. One of the side dishes I particularly enjoyed was a Korean scallion pancake called pajeon. O.Tofu’s version has crusty, dark, seared edges with an oily, savory exterior that encases a cakey, almost cornmeal-ish inside, strewn with green onions, and it was an absolute stand out that I won’t soon forget. Now that the sundubu jjigae had come down from scalding hot, I took a bite and relished the absolute silkiness of the fragile, aptly named silken tofu. It mimics a savory, creamy custard, and is the only gentle component of this gutsy brew. The oysters are thumb-sized but plump; their signature burst of salty and sweet character adding just the right counterpunch to the chile-dervied heat and kimchi-derived funk of the stew. If you like oysters, then consider this finding a pearl in a clay pot.